Our collection includes two tops: a halter necked shirt and a cropped sweater. It also includes high-waisted shorts as well as a beenie. We added zig-zag "volcano" stitching on the exposed zipper and created markings on the back which match the shorts. Snaps shut! Proud of this sewing job! Part of our challenge this week was to waste as little as possible so we used the rest of our fabric to make a purse. After draping the chiffon we found in the scrap pile we carefully hand-sewed it on the tube-top but had to be careful not to affect the elastic properties. 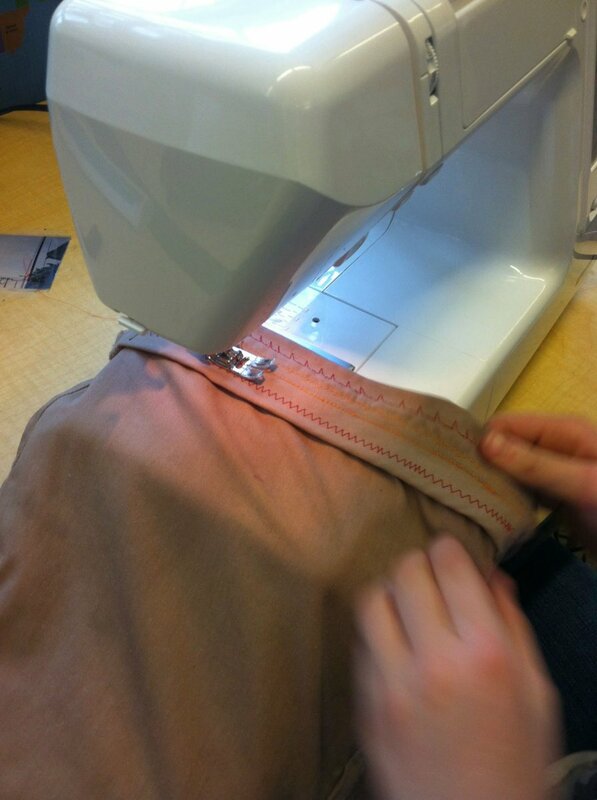 After sewing in snaps for the back we cut a zig-zag hem to match our inspiration! Took a while to figure out how to sew the beanie shut but it turned out great. After sewing it we dyed it brown to match the shorts. 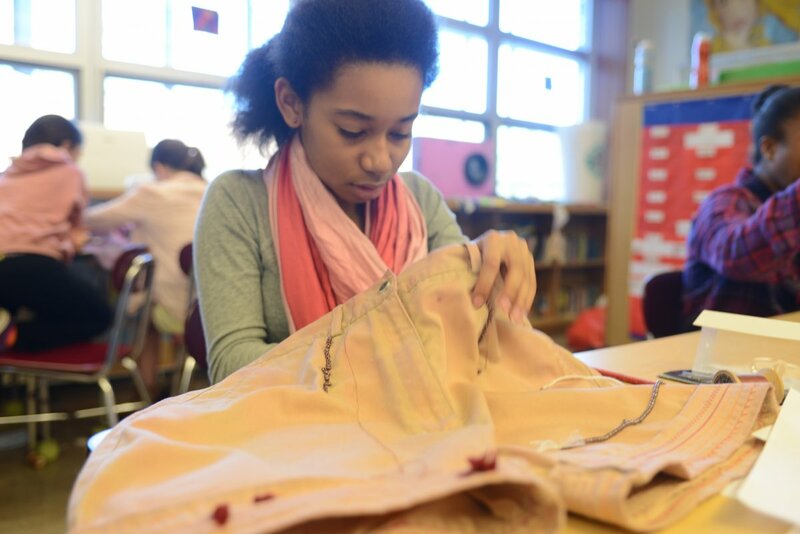 Adding volcano-like stitching in reds and yellows to bring our pieces together. Decorative stitching takes a lot of patience especially when the fabric is still wet from dye like these shorts were. We were inspired by volcanos like this one in Hawaii. 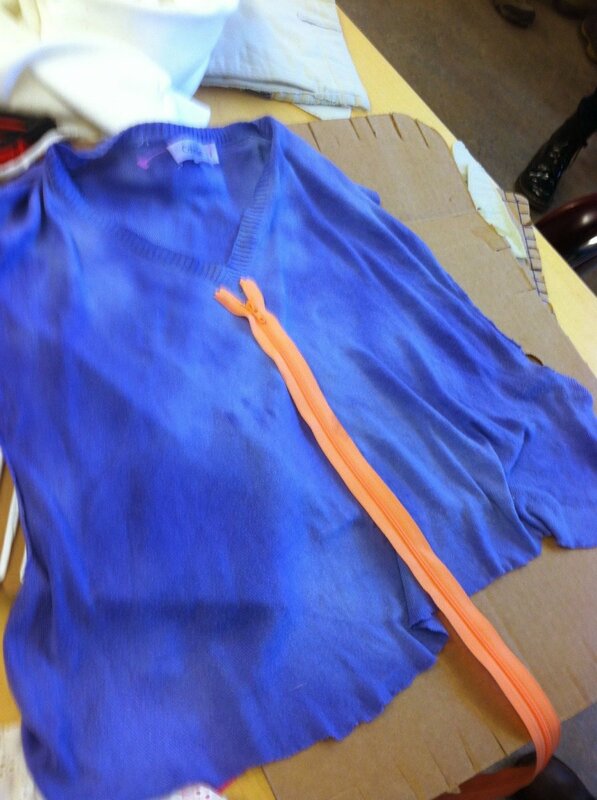 We used all natural dyes to dye the clothes. We made them out of food scraps from our lunches. First, we put the food scraps in a pot over a hot plate with boiling water. We chose the ingredients based on which colors we were aiming for. Certain colors were hard to make because those hues are not found naturally in our enviroment. Sometimes to make the colors we needed, we had to mix dyes. This is how we got the brown color of our shorts. Making the dyes was an intricate process, but it was fun and more environmentally friendly than chemical dyes. 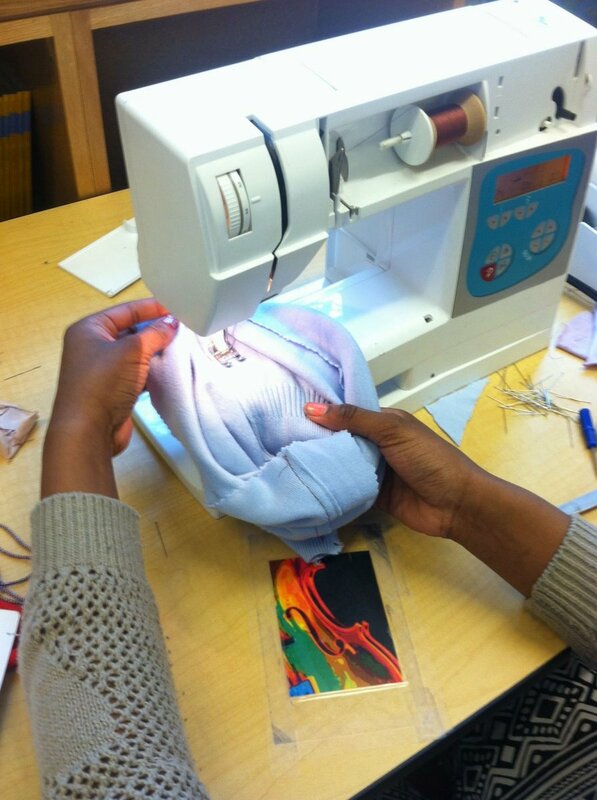 To begin our process we chose 5 articles of clothing from 18 unwanted garments we recieved from Martha's Outfitters. All 18 clothing items had stains, holes or both. We sat down together and began thinking about what would inspire us for our outfit. We thought of volcanoes because of their bold colors and power. We decided to make a volcano top and continue the theme into a pair of shorts. One of the articles of clothing we were given was a skirt. We decided to turn the skirt into a haltor top using the elastic string. We had made natural dyes using food scraps left over from our lunches that past week. We tie-dyed the haltor top orange and yellow since those were the colors of volcanic lava. We didn't use red becasue it is hard to create with the natural dyes. We then put the skirt/halter top in the dryer so it would dry quickly as we had little time. The drying smoothed the colors out until there was only a faint variation in the colors. Our next item were the shorts. We started out with khaki pants but cut them and cuffed the bottoms to add a finished look. We then worked diligently on creating the perfect brown for the shorts. We decided to dye them brown because it would represent the base of the volcano. After we let them dry the shorts became tinted pink. We sewed lines onto the cuffs in different colors and patterns and added beads along the seams. Furthermore we decided to make a beanie to compliment the shorts. The beanie was dyed a solid brown color. The brown on the beanie differed from the brown of the shorts slightly because the beanie was originally blue and the shorts had been khaki. However the colors still looked alike. We had an amazing time working together on this collection and hope to inspire others to be creative and do things that will benefit our enviroment and those less fortunate. Thanks for becoming interested in our cause!